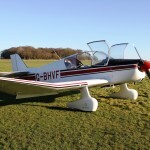 On 29 December, David Gibson, who now owns the Jodel D150 G-BHVF that I used to own, rang me to ask if I would like to go flying. The weather had been cold and clear overnight with temperatures down to around -7C. We met at Henstridge assuming that we would fly a quick trip to Dunkeswell – a very well trodden route. After pumping up the aircraft tyres, we rang Dunkeswell and were astonished to find that they were closed, despite this being holiday season and probably the best flying weather since Christmas Day. A call to Old Sarum established that they were open, but had plumbing problems resulting in no water, no tea and no toilets. After taking the map, I asked Dave what he thought of flying to the airfield at Farway Common, which is owned and run by Terry Case. “Have you been there?”. I had (albeit 25 years ago) in each of my two Luscombe Silvaires. The field has two runways (North South and East West), each 550m long. On phoning Terry, he suggested that in the calm conditions of the day, we should land on Runway 10 (toward the East) as this provided an unobstructed approach and an upslope to land into. We had the most lovely flight, myself flying and Dave working the radio. On arrival, we found a significant herd of sheep on the far end of the landing runway and quickly switched from a left hand circuit on RW10 to a right hand circuit on RW36. This was also slightly uphill and had a line of trees immediately short of the runway. I handed over to Dave, who flew an incredibly smooth and stable approach over the trees to a smooth landing. As we taxied down to the hangar, the sheep duly trotted off in different directions. Terry invited us in to have a cup of tea; he also had plumbing problems, but had drawn off a supply of water from his spring-fed supply. He said that he really enjoyed having visitors and, surprisingly, recognised me as having flown in before. He also told us some stirring tales of his time in the Army during the war and how much he enjoyed chatting with his flying visitors, who he found to be a uniformly friendly and interesting bunch. On signing in, I found that Hilary and I were the only second recorded visitors in the signing-in book, having joined a fly-in there in July 1987, flying from nearby Dunkeswell in our 1940 Luscombe 8A G-AFZN. 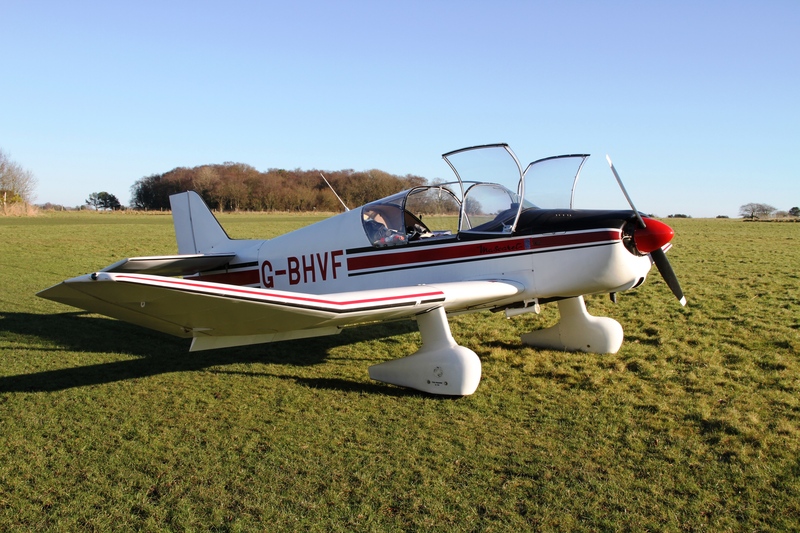 Our second visit, like this one, was from Henstridge in our 1946 Luscombe 8A G-AICX. Far too soon, we finished our tea and conversation and negotiated the electric fence back onto the strip. We elected to take off downhill on RW28 (without a sheep in sight) and a 35 minute flight in perfect conditions saw us back at home base, reflecting on a perfect morning’s flying.